Are you looking for a healthy dessert choice alternative to aid in your New Year’s resolution? I have just the recipe. 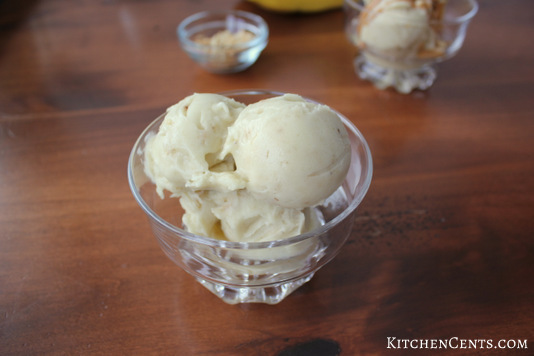 This easy 1-ingredient Healthy Banana Ice Cream is so creamy and full of natural sweetness. It’s even better topped with a spoonful of peanut butter sauce, crushed peanuts or both. Yum! So here’s a little back story on this “ice cream.” After getting married many years ago, my husband and I came to the conclusion that we needed to step it up and become a little more healthy. We went out and bought ourselves a nice juicing machine. Thinking this juicer was our key to becoming more healthy, we began juicing everything in sight. Fruits, veggies, and even some garlic, onions, ginger and radishes (all I can say is get a great perfume and some breath mints), everything. One day we were flipping through the manual one day we saw a few recipes for whole fruit “ice cream” or sorbet, made with frozen fruit. Anything with the words ice cream in it had us hooked. 😉 So, we froze a bunch of bananas and “juiced” them the next day. It was FANTASTIC! Creamy, sweet but still healthy. 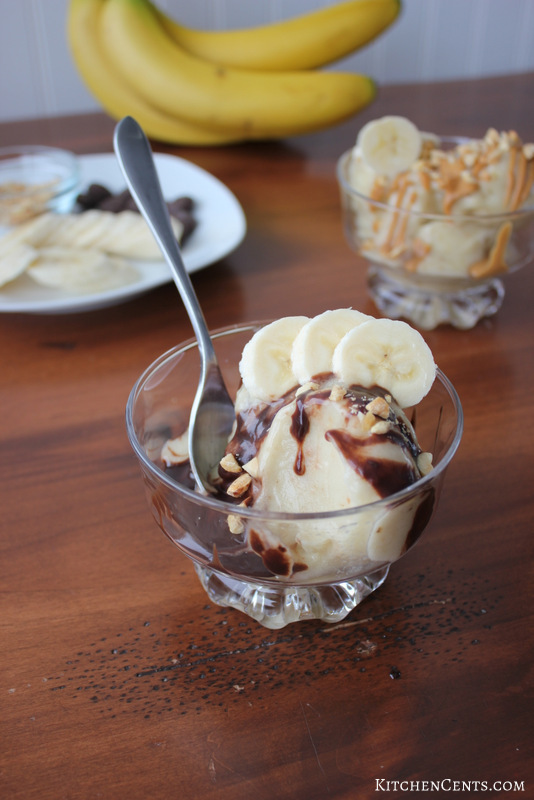 Even after experimenting with other fruits the plain, slightly brown-spotted bananas made the best ice cream. It has been a win for us ever since. Get ready for this ingredient lineup… bananas. That’s it! All you need is a bunch of frozen bananas. Toppings like peanut butter or chocolate sauce and chopped peanuts are optional (and recommended from me). The best bananas for this are the ones that are starting to go brown. These ones are sweet but not over ripe. 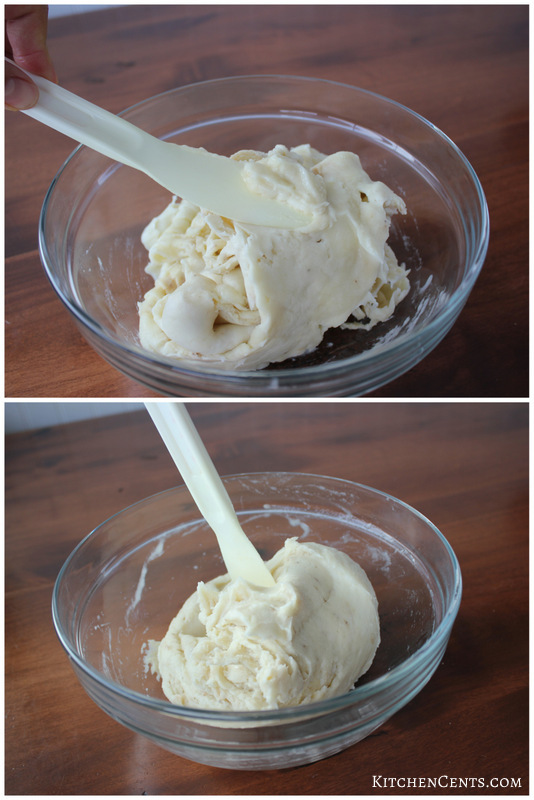 It make the ice cream perfectly sweet and sooo creamy without tasting over ripe. If you freeze green bananas the ice cream won’t be as sweet or creamy. 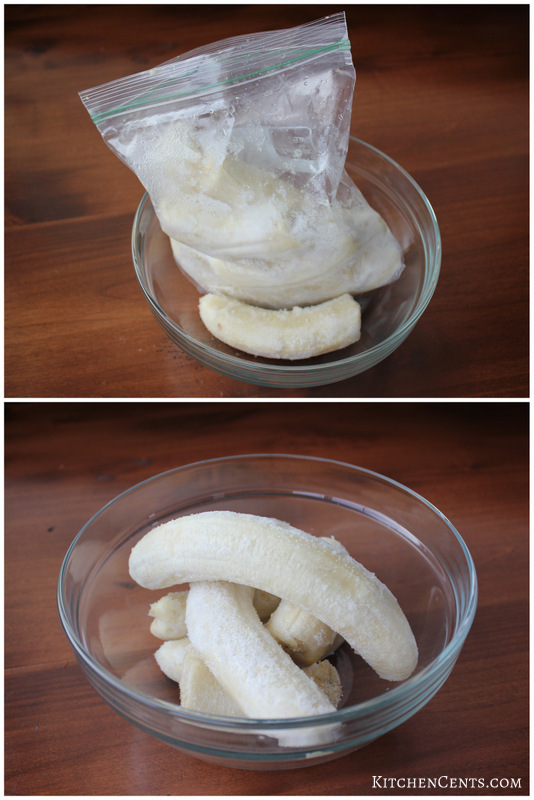 To freeze, peel the bananas and place in a freezer Ziploc bag. Freeze until hard. I usually freeze them the night before. 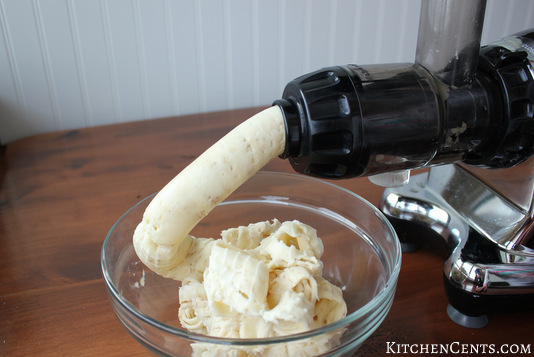 When you’re ready, pull the frozen bananas out of the freezer and using your juicer with the attachment that allows everything to pass through the machine (or a Vitamix bender). We have an Omega juicer and love it. If you allow them to thaw for just a few minutes they will come out a bit softer. In the end, the ice cream will end up about the same consistency whether you let the frozen bananas thaw slightly or not. Once the bananas have been juiced, stir until they become smooth and creamy. It should look something like this. 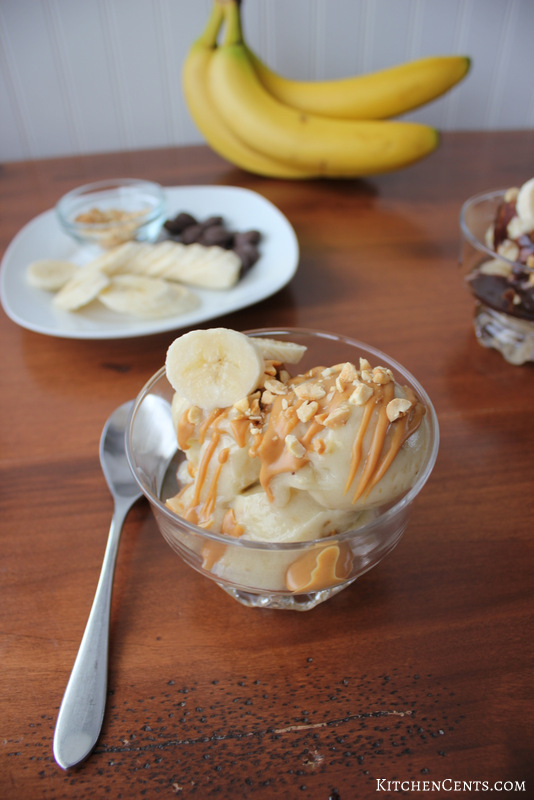 Scoop the banana ice cream into serving dishes or freeze for later. When we make this, we can’t resist and eat it immediately. I personally like the softened texture compared to completely frozen. If you’d like to go more healthy with toppings, try heating a scoop of peanut butter in the microwave for about 30 seconds. 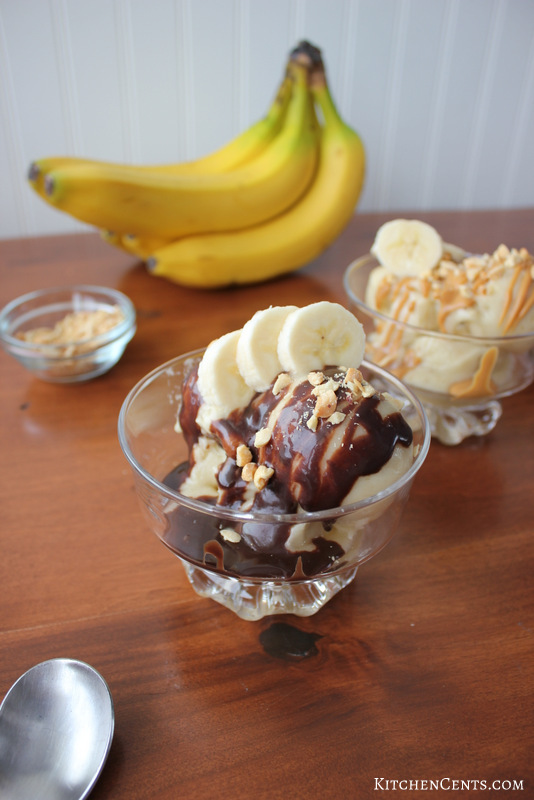 It will melt the peanut butter enough that you can drizzle it over the banana ice cream. 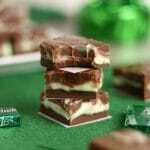 if you’re ok with a bit of unhealthy, try microwaving 1 tablespoons chocolate with 1 tablespoon cream to make a simple chocolate ganache sauce. The Chocolate compliments the banana so well. 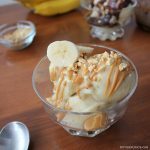 I’m more of a peanut butter lover and my husband is more of a chocolate lover but our little misses would prefer this ice cream Plain Jane style. Any way you have it, it’s sure to satisfy that sweet tooth while staying on the healthier side of things. Are you looking for healthier alternatives? What’s your favorite healthy sweet treat? This ice cream is so creamy and full of natural sweetness. 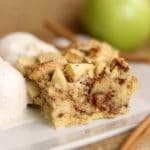 It's sure to satisfy your sweet tooth while staying on the healthier side of things. Peel ripe bananas and place in freezer ziploc bag. Freeze until hard or overnight. 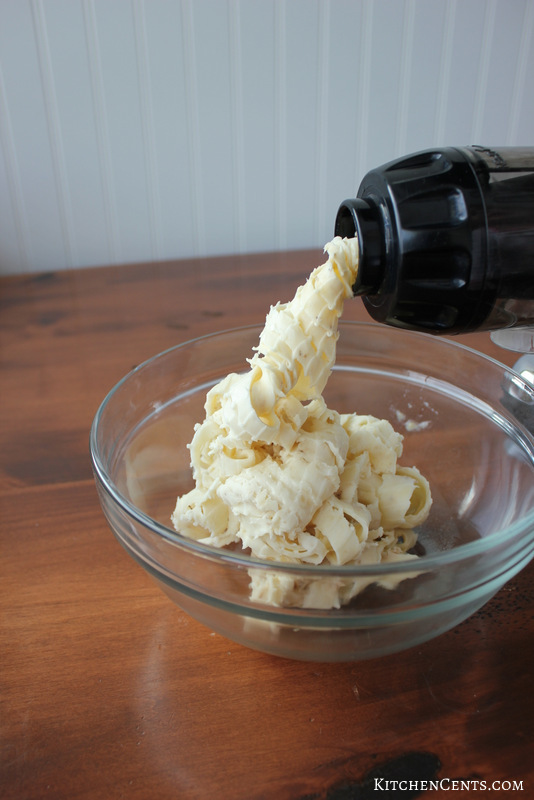 Using a juicer with an attachment that allows everything to pass through the machine (or a vitamix blender), grind bananas. 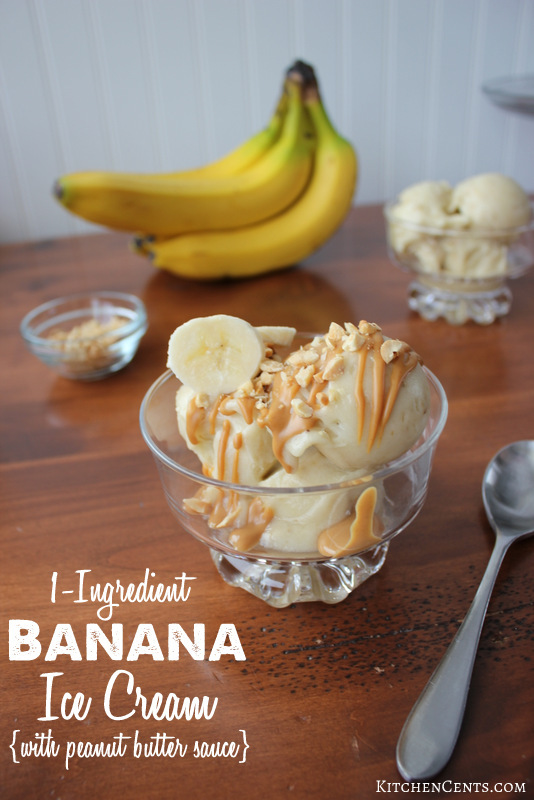 Mix banana until smooth and creamy. Serve or freeze for later. 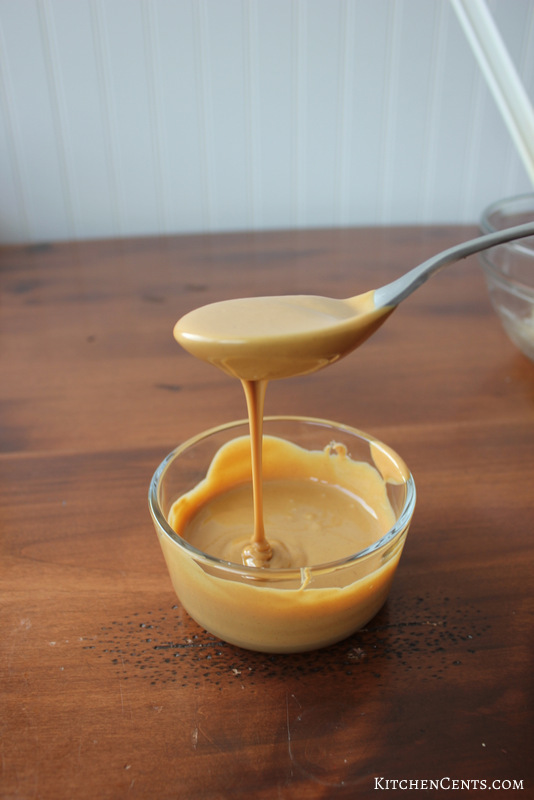 Peanut butter sauce- microwave a scoop of peanut butter for 15-30 seconds. Simple Chocolate ganache sauce- microwave 1 Tablespoon chocolate and 1 Tablespoon cream for 15 seconds. Stir until combine. 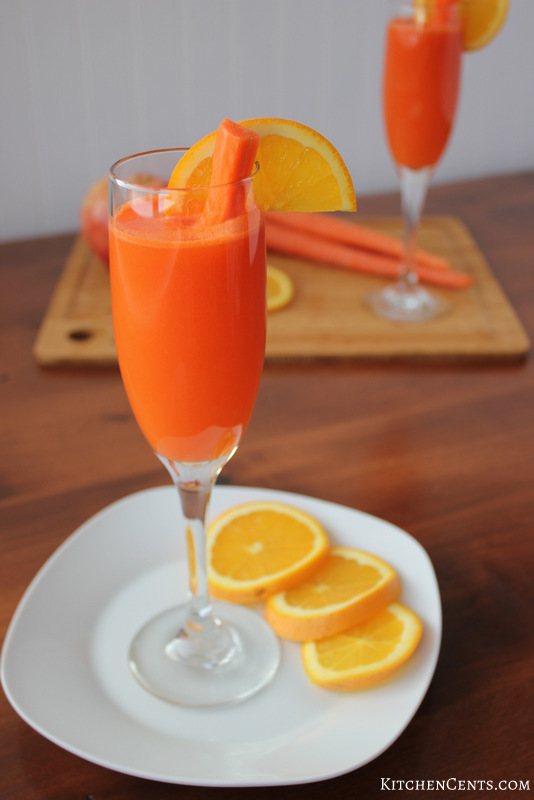 If you’re looking for another great recipe you can make with a juicer like the Omega, check this Carrot Citrus Sunrise Mocktail. It’s healthy and delicious on any morning! I love how this tastes like ice-cream but its bananas. The healthy (hidden) part of this is crazy! I wonder what else we could do to make this super fabulous? We’ve tried making “ice cream” with other fruits like strawberries, pineapple, mango, peach but the banana is the most creamy and sweet of them all. No need to add any cream or sugar. 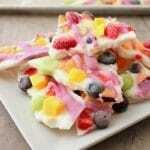 You can definitely play around with the toppings to make it that much more fabulous though. 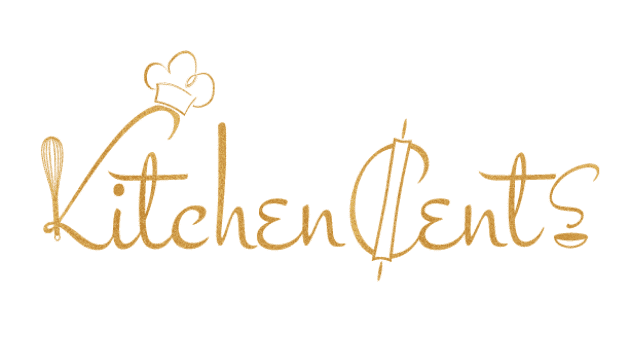 Doing a fruit sauce like this 5-Minute Simple Berry Syrup ( http://kitchencents.com/5-minute-simple-berry-syrup/ ) would be awesome and a little whipped coconut cream. YUM! I have never even thought of doing that but what a great alternative. SO much more healthy than real ice cream, yet a similar consistency. Looks yummy! I love homemade ice cream. Unfortunately, I am not a banana fan though! Yum! Such an interesting flavor also, my dad would love it! This looks so good!!! 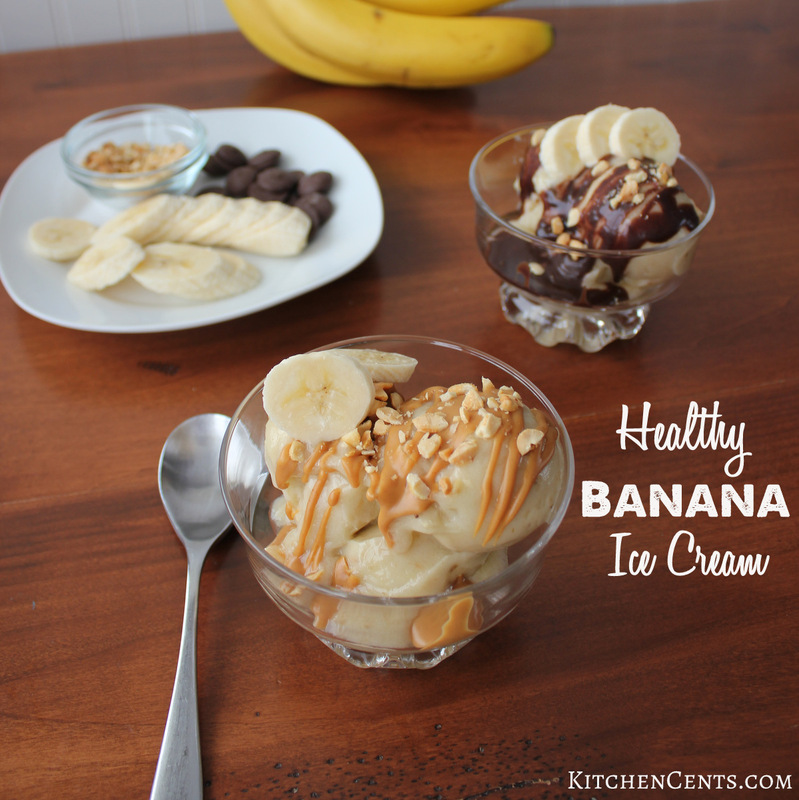 I love the idea of making a healthy ice cream, I bet my kids wouldn’t be able to tell the difference at all. This looks really good, we would love to try this for a treat night at our house. This looks divine. My family is bananas for bananas. We can’t get enough of them. Oh my gosh yum this sounds absolutely delicious! 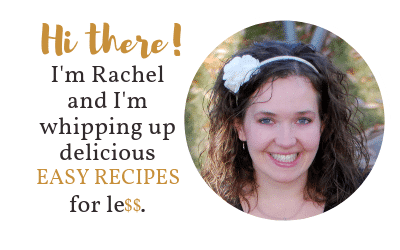 I would have never though of making this but am so glad to have the recipe. This looks delicious. I actually have frozen banana in the freezer ready to be used! My kids love banana so I’m going to try this at home. i am sure they’re going to love this!